There are a lot of things you need to check when you are about to buy a high chair for your baby. When a couple gets blessed with a baby, the first thing the parents do is to make sure that their house is safe and comfortable for the baby. Similarly, when you are about to shift your baby to a solid diet and want to bring a high chair for him then the first thing you need to make sure is that the high chair is safe and comfortable for your baby. My little bundle of joy turned 8 months last week, so I decided to reserve a special place for him at our dining table. For this purpose, I embarked on the quest to get the best high chair for my baby. I not only searched through the markets but I also surfed through Amazon to get an idea about the best options available. Here are top ten high chairs for babies that I saw on Amazon. I must also make it clear that these high chairs were purchased by some of my best friends and relatives so I got first-hand reviews on these high chairs. How I conducted the research and why you should trust my research? Which one is best for your baby? 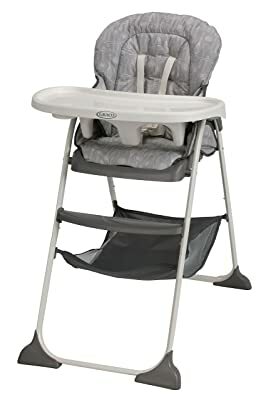 This Cosco Simple Fold High Chair is quite safe and relaxing for your little one as it carries a lot of unique features. The greatest thing about this chair is its reliable frame. If I am buying any of these high chairs then I would definitely go for the one that has the strongest structure. Due to its Elephant Square base, this high chair easily stands firm on even the most slippery surfaces. So if your little bundle of joy has dripped some water on the floor, even then you don’t have to worry about your baby falling down due to slippery floor. The fabric used on the seat is quite easy to clean so you won’t have to worry about your baby making all that mess. It is highly portable! The chair can easily be foldable so you can easily transfer it to any location. It is very light-weight so you can easily move it from one place to another. The no-nonsense design enables you to attach all the chair-parts within a matter of few minutes. The chair is able to bear the weight of up to 50 pounds due to its extra-strong structure. The three-point harness keeps your baby safe while sitting on the chair. This chair is perfect for you if you are looking for something that offers a sleek and stylish look. Not only this chair will look pretty in your kitchen but it will also help the food tray stay in the place due to its magnetic tray attachment. The high chair not only comes with a magnetic tray but it also comes with bowls and plates that are compatible with the tray. Due to its high-quality material, it is quite easy to clean. So if your baby makes a mess while eating then you can just wipe that mess off the chair. The seat becomes quite comfy due to high quality, breathable foam. Hey! Did I mention that the foam is removable so you can easily remove the foam while cleaning or packing and reinsert it later! The tray liner could also be removed easily so you can wash it and fix it back in the chair. The adjustable height of the table will help you serve food to your little bundle of joy in a comfortable way. The chair is available in two different color combos of white/grey and black/grey so if you have a baby boy then it will be a perfect gift for him. 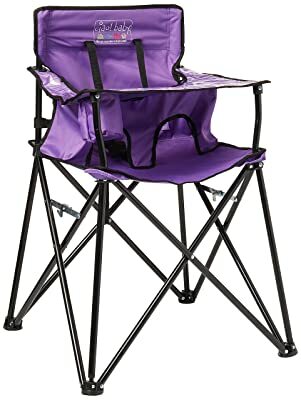 Due to the high-quality plastic used in the manufacturing, this chair can easily bear the weight of almost 60 lbs. If you are seeking for something in wooden then here is just the thing for you. This Abiie Beyond Wooden High Chair with Tray is the most perfect and coziest high chair I have seen during the last few days. Again, I would emphasize that this chair is perfect for you if you are looking for something in wooden. The feature of EZ seat makes this chair quite entertaining as the high chair can be transformed to any height or position. You can either use this chair as a baby high chair or you can also transform it into the traditional dining chair for the kids of all ages. The entire transformation procedure takes less than 20 seconds. Another great aspect of this high chair is the warranty offered by its manufacturer. The company offers three year’s warranty plus it also offers the extended protection plans of one, two or three years at extremely low cost. Due to the use of stain-resistant and waterproof fabric on the cushions, cleaning this chair seems like a piece of cake. All you need to do is to wipe off the food with the help of a damp cloth or baby wipe and the chair will look as good as new. The chair comes with a removable food tray that is not only easy to wash but it is also dishwasher safe. This high chair is extremely safe for your little baby due to the fact that it went under the anti-microbial heat sterilization at 120 degree Celsius. If you are looking for something that is durable and useful even when your baby outgrows it then Evenflo Convertible High Chair is a great option for your baby. Not only will this baby chair carry your baby through the infant years but it will also be perfect for your child till he reaches the age of 3 to 4 years. The chair is structured in such a way that it transforms into a perfect high chair. The height of the chair is suitable enough to feed a toddler in a comfortable way. So if you are tired of bending over the high chair in order to spoon-feed your baby then this chair is the biggest solution to your problems. This high chair can also be separated into a small-sized chair and a table so your little one can also enjoy some floor-time. The best thing about this high chair is that it is also suitable for the children around the age of three to four due to the fact it can be turned into a separate table and chair. As the baby grows up, this separate table and chair can be used for a variety of purposes such as it can be used as a separate dining table for your child, it can be used as a play table or it can also be used as a study table. This high chair is available in two different colors i.e. green and shocking pink so whether you have a baby girl or baby boy, you have color-options for both of them. 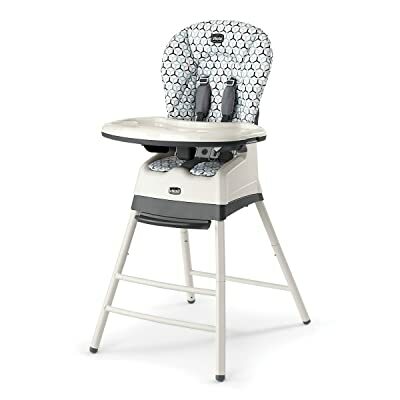 Graco Slim Snacker High Chair is perfect for all those mothers who face a hard time finding a place to stack their baby’s items while feeding him outdoors. This chair comes with a storage basket that is perfect to store your baby’s items whether you are feeding him inside the house or at any outdoor location. This high chair is highly portable. 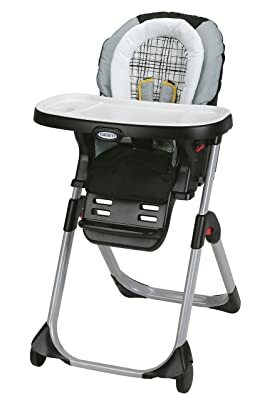 If you are constantly on the move with your baby then this high chair will be perfect for you as you can easily fold this chair within a matter of a few seconds. The ultra-slim design of this high chair makes it easy for you to adjust it even in the narrowest places of your house. 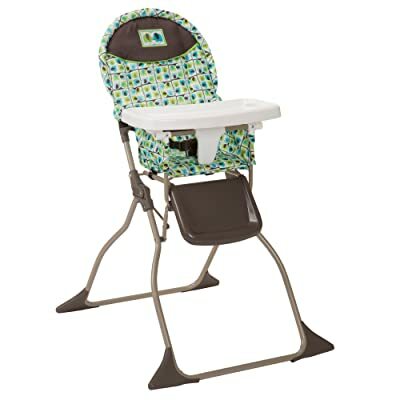 Once folded, this high chair can be placed safely in any closet or shed due to its self-standing fold feature. The tray has been created from easy-to-wipe plastic so keeping it clean is not an issue. The seat has been covered with a high-quality breathable fabric that is easy to wash. So if your baby drips something on the seat, there is nothing to worry about because it can easily be cleaned. 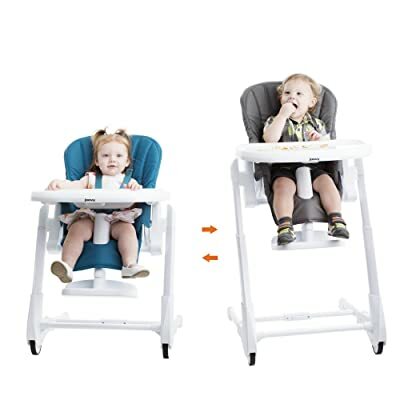 If you are not able to find a high chair that offers you a suitable height or position to feed your baby then I would suggest you to give a try to this JOOVY Foodoo High Chair. Available in turquoise color, this chair offers you with certain heights and certain position along with other intriguing features. The seat has been covered with special leather so it is quite easy to clean even if your little prince has made a lot of mess. 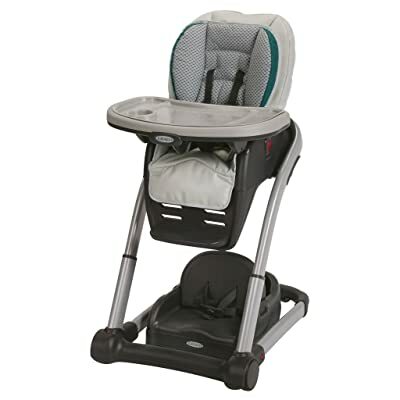 This high chair comes with eight different adjustable positions along with five recline positions. Your baby will also be able to rest his feet in a comfortable position while sitting on this high chair due to its two different footrest positions. It also offers two different positions for the adjustment of the tray. The tray has been created from high-quality plastic so it is extremely easy to wash. You don’t have to worry about damaging its look as it is also dishwasher safe. The structure of this chair is strong enough to carry the weight of almost 50 lbs. This chair is highly portable due to the fact that it contains a pair of high-quality wheels. If you are one of those parents who like to invest in things that offer more than one benefits then here is something you are going to love. 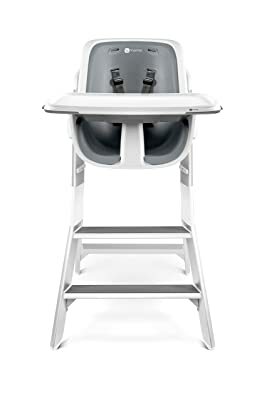 This Graco Blossom 4-in-1 Convertible High Chair Seating System offers you more than one benefits by converting from a baby’s high chair to an infant booster and then to a youth chair. This high chair comes with six in one feature as it can quickly be converted from a high chair to an infant feeding booster and then to the youth chair from a toddler booster. The greatest aspect of this high chair is that it is spacious enough to seat two toddlers at a time. So whether you use it as a high chair and toddler booster or as a youth chair and infant feeding booster, you can seat two children in it at the same time. Due to the presence of a seat back that is easy to adjust or remove, you can easily put your growing baby in a comfortable position in the seat. The leather cover on the seat is easy to clean so if your baby makes a mess, just wipe it off with the help of a damp cloth. The seat pad can easily be washed in the machine. The seat also offers complete infant head and body support so your child will be extremely comfortable while sitting on this chair. 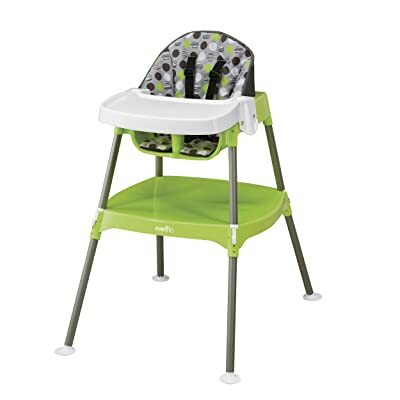 If you are searching for something durable then this Chicco Stack High Chair is a perfect option for you. It is a three in one chair as it can easily be converted into a booster from a high chair and into a stool from the booster. The seat can be adjusted at three recline positions with just one movement. Cleaning the tray is not an issue as it can easily be removed and fixed back. The tray is also dishwasher safe so you don’t have to worry about damaging it. The seat pad has been created from such fabric that is easy to clean. You can either wash it in the machine or you can wipe off the food material through the help of a damp cloth. While feeding your little peek-a-boo, you can easily store the tray on the rear legs of the high chair. I mean I have used it for two of my kids and the seat is still intact. Another one from Graco, this DuoDiner is also one of my favorites. Even though it is a bit expensive than the other Graco products but it also offers a lot more features than them. If you are thinking about investing in something heavy then here is a perfect fit for you. The seat can be adjusted at three reclining levels so whether you want to adjust your baby’s level according to your kitchen table or your dining table, the task becomes quite easy with this chair. The high chair can be adjusted at five different heights to help you adjust your little prince at a comfortable position. The footrest can also be adjusted at a comfortable position for your little bundle of joy. The high chair can easily be converted into a booster when it is required. The seat has been created from such fabric which is easy to clean. It can also be washed in a machine. The tray can easily be removed and fixed back. It is also easy to clean due to its dishwasher-friendly nature. 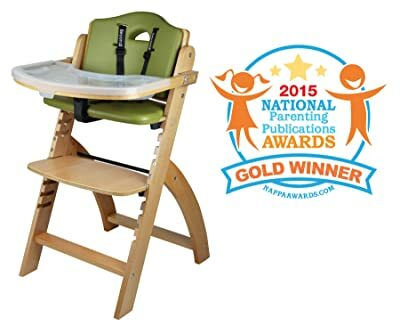 At number 1, I would like to introduce you to a portable high chair from ciao! Baby. It is a perfect high chair for you if you are searching for something that can easily be transferred to different places. It is extremely light-weighted and comes with a flexible design that can easily be folded. The chair can easily be transported to different places. It can easily be reassembled as the spare parts can easily be clicked and joined together. The chair comes with various locks in order to ensure that the spare parts are strongly reassembled. It is a perfect asset for all those parents who are constantly on the go! If you are planning a beach trip this summer then don’t forget to get one for your little prince. Another important feature of this chair is its five-point safety harness due to which it meets the safety guidelines put forth by EU high chair safety standards, US ASTM and CPSIA. It might seem delicate but it can easily bear the weight of a three-year-old child. Due to its slippery fabric, it is quite easy to clean. All you need is a damp cloth and the chair would seem good as new. Most of you might be wondering that why you should trust my research. Well, the answer is that like all the other parents out there, I am also a concerned and protective parent of two adorable kids. I don’t believe in picking anything from the market just because I saw its advertisement on TV. I have a staunch belief in conducting a detailed research before purchasing any item of use for my kids. Before purchasing a high chair, I consulted my family pediatrician and asked him about the details that I should check in different high chairs in order to pick the best one for my kids. Is the tray removable or not? After getting all my facts straight, I started making an online and market research on the top portable high chairs. I also asked my friends and relatives on the type of chairs they were using for their babies. I took my little one to the kids’ store with me and practically checked each of the chairs by making him sit in the chair, adjusting the height and seat. I also asked around for the reviews on each chair and also checked for the online reviews. During my research, the two important things that I kept in mind were the safety and comfort level of my kids. Most of the encounter an accident by falling off the high chair or most of the high chairs loose balance due to use of the bad quality material. After conducting the detailed research for almost a week, I finally narrowed down the above mentioned ten high chairs which in my experience are the best. I would strongly suggest you, to select your baby’s high chair according to his needs, comfort level and the environment of your house. If you are a stay-at-home parent and have more than one kids then its best to go for something heavy but if you are mostly on-the-go then I would suggest you pick a light-weighted high chair from the list.